Okay, anything FREE and you have my attention!! The deal here is that if you're a Spotify Premium user they will send you a free Google Home Mini. It's a chance for Google to highlight their partnership with 3rd party software on the speaker ... now prices run $10/month for premium and there's nothing that really says how long you have to be a premium member for to be able to claim the freebie. At lowest, we see the Home Mini go on sale for about $35-40, so if you can sign up, get and cancel in under 4 months, you're coming ahead of the game. Or, just enjoy Spotify. It's not for me, but that's just me. Still... free anything. Keep in mind, supplies are limited. With Spotify Premium, subscribers have unlimited access to the songs, playlists, and artists they love—and love to enjoy. Starting today, we are teaming up with Google Home to give Spotify Premium subscribers (both new and existing) in Canada a Google Home Mini as part of their 9.99 CAD/month subscription. Now, music lovers will be able to share their favorite music, simply by asking their Google Home Mini powered by the Google Assistant. With Spotify Premium and Google Home coming together to invest in voice, streaming your favorite songs and playlists has never been so easy. And it’s just the beginning. The Google Home Mini will be available for a limited time to 9.99 CAD Premium subscribers in Canada at URL starting on April 9. We’ve even streamlined the set-up to get you started and playing Spotify sooner. * New and existing Premium subscribers can sign up for a Google Home Mini HERE starting on April 9, 2019. 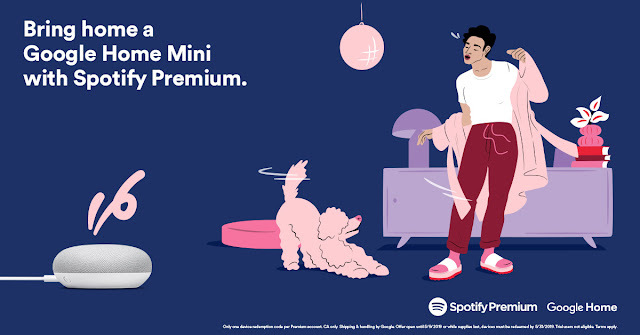 Note, this is a limited offer, only available for individual full priced Canada Spotify Premium subscribers until May 9, 2019 or while supplies last —so don’t wait.